The KC500 Wedge 1-1/4 in. x 84 in. 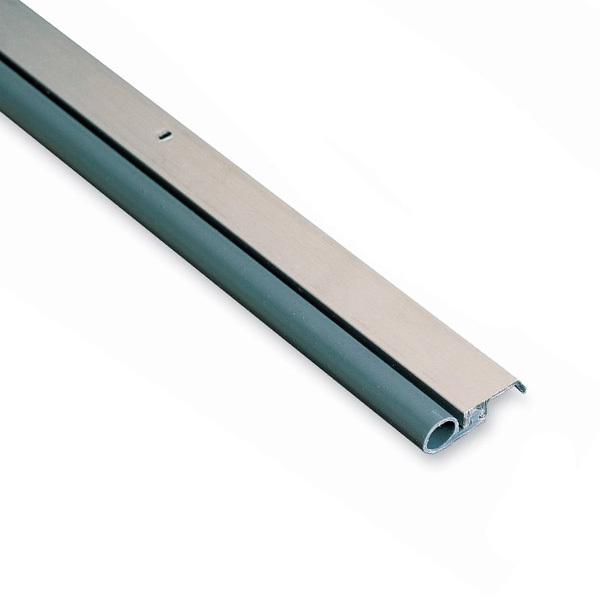 style weatherstripping is a popular selling, professional grade door weatherstrip set that originated in Canada and quickly became popular in energy efficiency programs throughout the U.S.A. The triangular Santoprene sealing gasket commonly referred to as The Wedge has proven to be more effective in sealing large and small gaps than vinyl bulb type weather-stripping. Unlike vinyl bulb weather-strip, The KC500 Wedgesealing gasket stays pliable in sub-zero temperature and will not crack, shrink, become brittle or stiff. This weather-strip needs no caulking because of its back seal a feature not found on most other brands. Seals drafts on large and small gaps alike. Works well on warped and inconsistent doors. May be used on new or old residential or commercial doors. Slotted screw holes for easy adjustment; includes Phillips-head screws. Great for improving long-term energy efficiency, stops drafts and seals in comfort. AM Conservation Group, Inc. specializes in weatherization, water, and energy efficiency products for the professional and consumer alike.